Lead magnets are one of the best ways to get more email subscribers. If you don’t have a lead magnet or you don’t have a good one, then this resource could literally be a game-changer for your business. 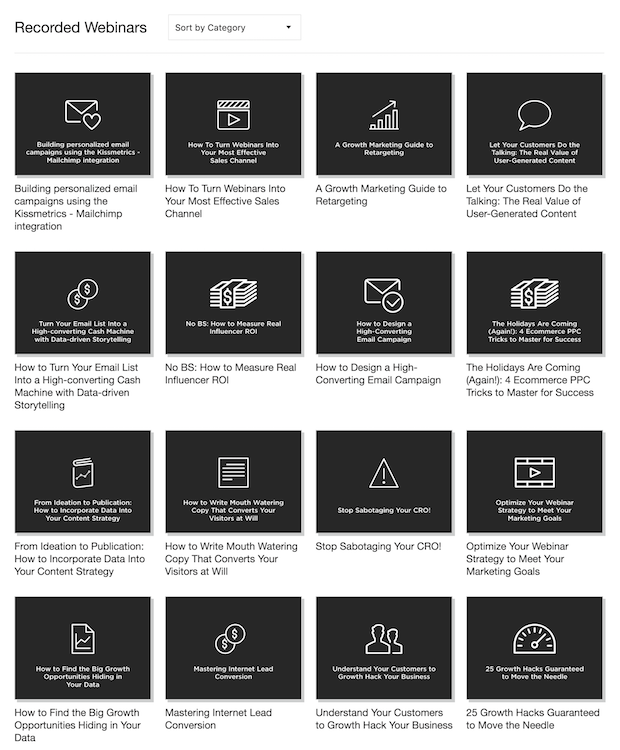 Here are 69 highly effective lead magnet ideas and examples to grow your email list. Exclusive Bonus: Download the 69 Irresistible Lead Magnet Ideas to grow your email list. A lead magnet is an incentive that marketers offer to potential buyers in exchange for their email address, or other contact information. Lead magnets usually offer a piece of digital, downloadable content, such as a free PDF checklist, report, eBook, whitepaper, video, etc. If you want to generate leads online, then your business needs a lead magnet. Period. Why? Because email is a very personal thing. People aren’t simply going to give you their email address without a good incentive, even if they like your brand. As a marketer, it is your job to give them a compelling reason to do so. For example, let’s say you have a blog post on the top 10 ways you can improve your customer service. At the end of the post, you ask readers to join your email list for “updates”. Or instead, you could ask readers to join your email list and get a free, downloadable PDF case study, detailing a real-life example of one business who used these 10 strategies to improve their customer service. Which offer do you think will get the most email signups? So, now that you understand the importance of lead magnets, you may be wondering what makes a good lead magnet. What Makes a Good Lead Magnet? Solves a real problem – if your lead magnet doesn’t solve a real problem that your customer avatar has, or if it doesn’t give them something they really want, it won’t work at all. Promises one quick win – your lead magnet should promise (and deliver) one quick win for your avatar. In other words, it should help them to easily achieve something. Super specific – don’t create a lead magnet about something general. The more specific you are about the benefit of your lead magnet, the better it will convert leads. Quick to digest – PDF checklists tend to convert really well because they are so quick and easy to digest. eBooks or lengthy reports may make your prospects feel overwhelmed. High value – your lead magnet should have both high perceived value and high actual value. Instantly accessible – your lead magnet will work best if it is something that can be delivered right away. People love instant gratification. Demonstrates your expertise or UVP – when someone consumes your lead magnet, it should demonstrate your expertise or your unique value proposition. This helps turn leads into customers down the road. 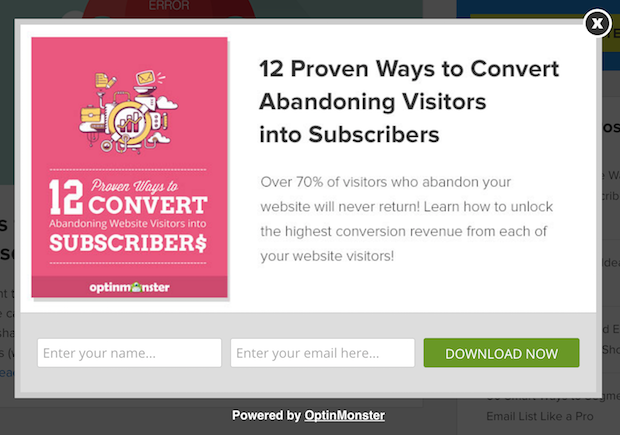 Here on OptinMonster, one of our lead magnets is “12 Proven Ways to Convert Abandoning Visitors into Subscribers” (see screenshot above). Solves a real problem our customer avatars have: visitors abandoning their site, never to return. 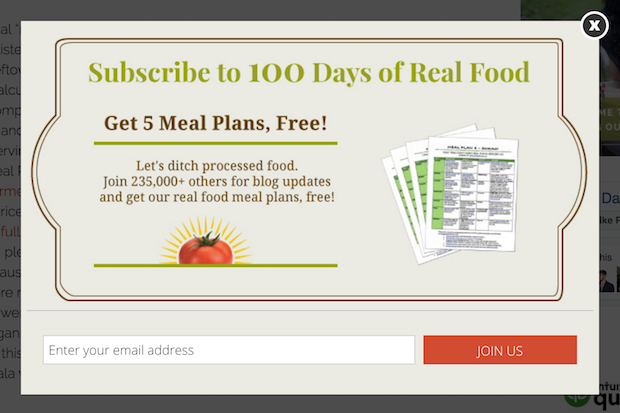 Promises one quick win: converting those abandoning visitors into subscribers. 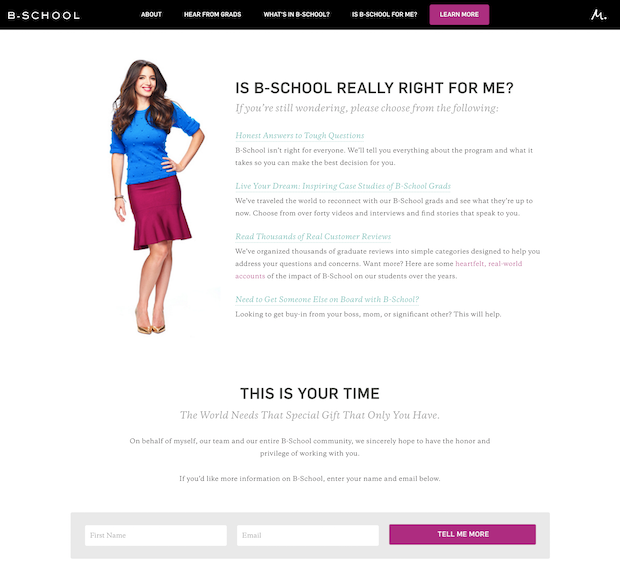 It’s specific: we aren’t teaching you how to convert all your visitors, just your abandoning visitors. It’s quick to digest: it’s a PDF checklist. It’s high value: following these 12 tips can directly translate into a big increase in sales for your business. It’s instantly accessible: you can download it at the click of a button immediately after entering your email. It demonstrates our expertise: we are really awesome at converting visitors into subscribers, and this lead magnet proves that. Here are 69 lead magnet ideas, broken down into 5 major types. Ready to create your lead magnet? Let’s dive into the 69 highly effective lead magnet ideas to increase your subscribers. Useful opt-in bribes help to save your user time, energy, money, and more. This type of lead magnet is the most irresistible of all the types because it’s a “silver bullet”: one specific, actionable solution to a problem. It’s human nature to want the greatest outcome for the least amount of work, so make sure your lead magnet does all the hard work for them. Let’s start with our favorite lead magnet of all: the checklist. Checklists convert the best out of all the lead magnets, probably because they are so easily consumed. 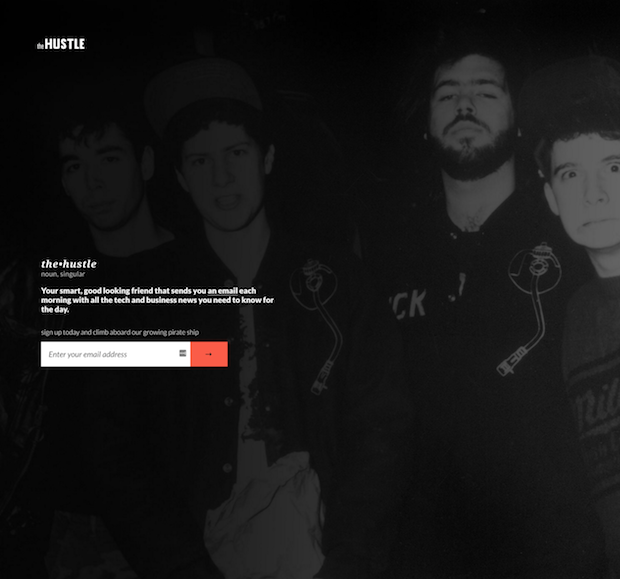 They condense everything that the user needs to know into one, actionable list. They’re also super quick to create. For example, you can summarize your popular blog posts as a checklist, and turn it into a content upgrade. Then combine that content upgrade with a 2-step optin form, and you’ll see a big boost in your conversions. 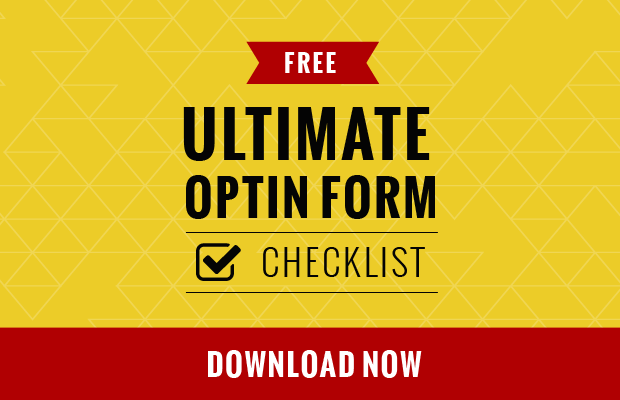 Ultimate Optin Form Checklist– this checklist contains a list of all 63 elements that you need to create the ultimate optin form. On-Page SEO Checklist: How to Fully Optimize Your Posts– you can print this out and consult it every time you search engine optimize a page. Cheat sheets are essentially the same thing as checklists, but they give the user a list of guidelines, or a process that they can follow over and over again to achieve a specific benefit. Cheat sheets are so irresistible to people because they take away the need to think. 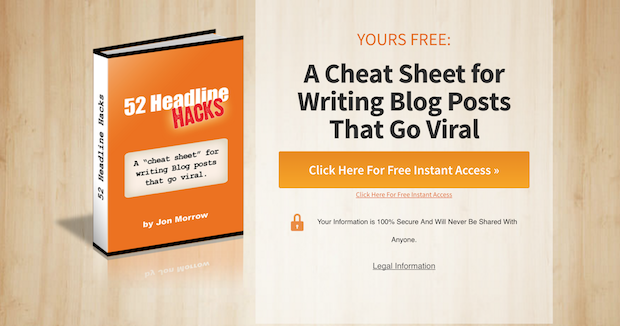 Here’s an example of a cheat sheet created for bloggers: 52 Headline Hacks: A Cheat Sheet for Writing Blog Posts That Go Viral. Bloggers want their blog posts to go viral, so this is a very benefit-driven lead magnet for them. It also removes the need to think: no more racking your brain about how to get your blog posts to go viral when you have this cheat sheet! A template can be anything that provides an outline, or some sort of starting point, so all the user has to do is fill in the blanks. 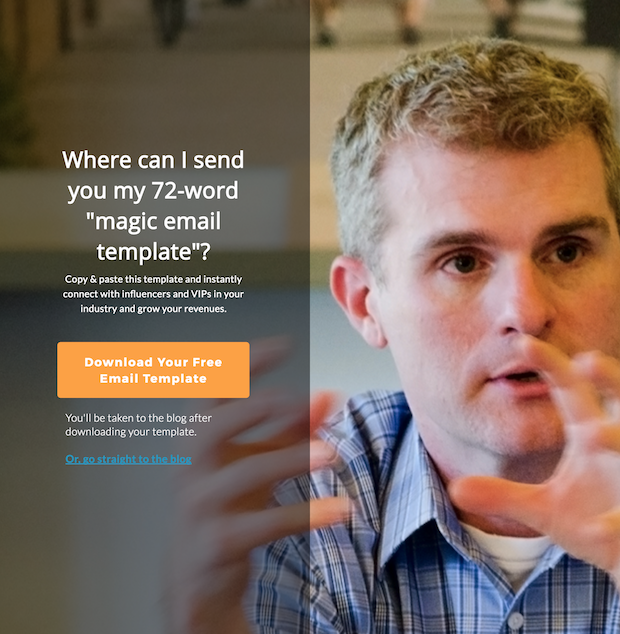 The Magic Email Template is a great example– it’s something that entrepreneurs and small business owners can simply copy and paste, customize a few words, and then send off to instantly connect with influencers and VIPs in your industry. 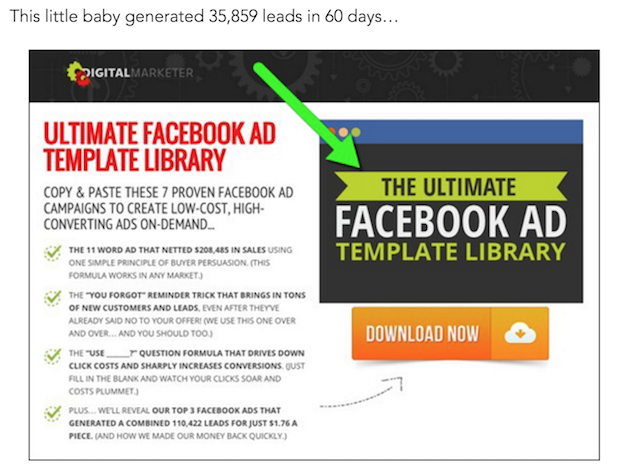 To take your lead magnet one step further, create an entire collection of templates, like Digital Marketer’s Ultimate Facebook Ad Template Library. Swipe files are arguably even more irresistible than templates, because all you have to do is copy them in their entirety. 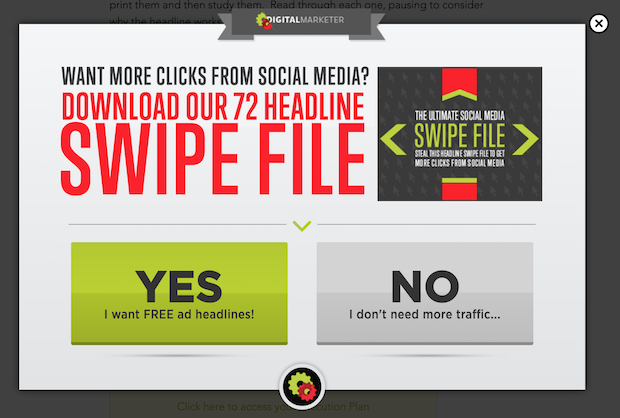 For example, The Ultimate Social Media Swipe File includes 72 headlines for social media posts that you can simply, well, swipe! Examples work really well as lead magnets because people are searching for examples all the time, in all different industries. 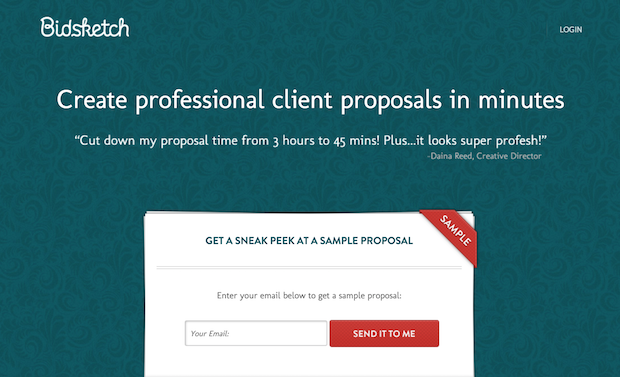 For instance, Bidsketch (a proposal software) uses a Sample Client Proposal as a lead magnet. In fact, you could turn one of your popular posts into a lead generating machine by optimizing it for “[your keyword] + examples”, and then adding an example lead magnet as a content upgrade. Scripts are great lead magnets if your buyer persona needs something to help them speak or write. For instance, if they need help prepping for a job interview, you could offer a script for pitching themselves to a potential employer. 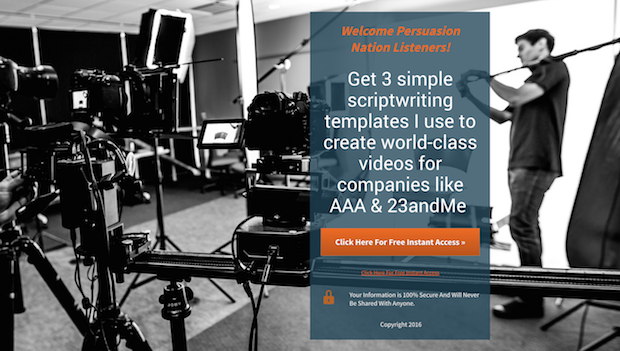 Another great example is this popular lead magnet created by Marcus Krieg: 3 Persuasive Video Scripts You Can Steal. A really popular type of lead magnet is the toolkit. Why? Because everyone wants to know what tools the pros use! 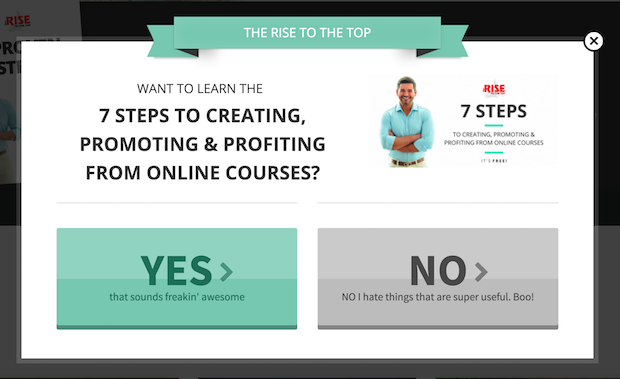 Syed’s Toolkit for Growing Your Online Business is no exception… it’s a huge hit! The best part about toolkits is that you can usually become an affiliate for those products. So not only does the toolkit provide a really useful resource to your visitors, but it can also generate additional revenue for your business. A web app is a free tool that lives on your site, and which requires a login to use. Of course, users have to sign up by email to get the login. 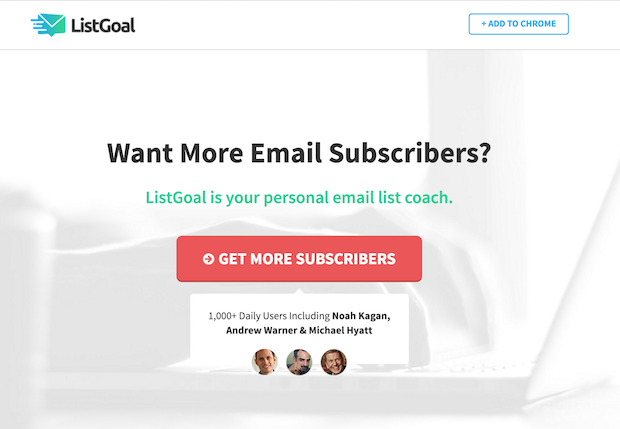 For example, Bryan Harris created this web app called ListGoal, which is completely free to use. However, when you sign up for it, Bryan gets your permission to email you. Lists of resources are really valuable because they are huge time savers. Whenever you pull all of the best stuff together, you’re saving your users a ton of research time. 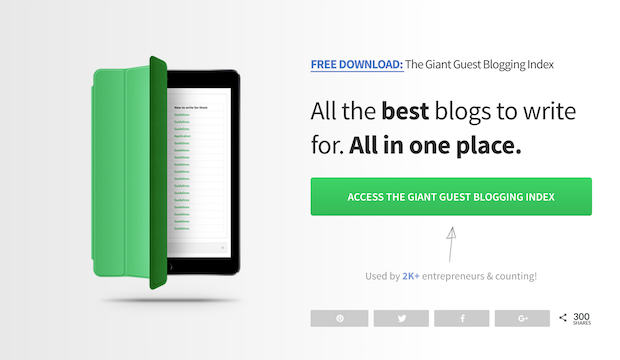 My Giant Guest Blogging Index has been a huge hit for that very reason. For someone looking to write guest posts, all the tough research has been done for them. Calendars can also be extremely useful in a variety of industries. 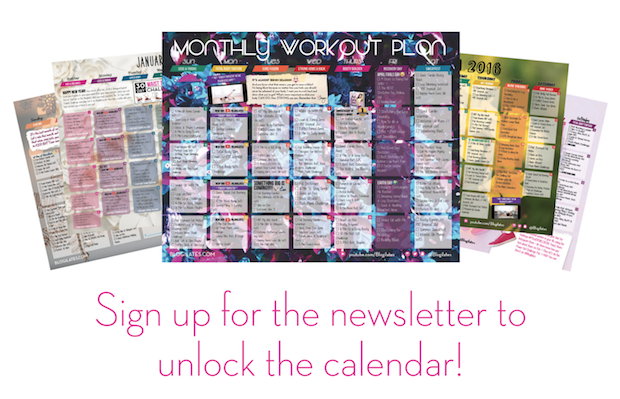 For example, if you’re in the fitness industry like Blogilates, you could offer a workout calendar. That way, your users don’t have to think about what exercises to do each day, because you’ve already mapped it out for them. Similar to a calendar is a plan that you’ve mapped out for someone on a daily, weekly, or monthly basis. For example, 5 Free Meal Plans is a great lead magnet for a busy mom who is struggling to find the time to figure out what’s for dinner every night. Your lead magnet could even be a blank planner that the user fills in with their own plan. These blank planners are really useful too because they make it easier for people to organize themselves. 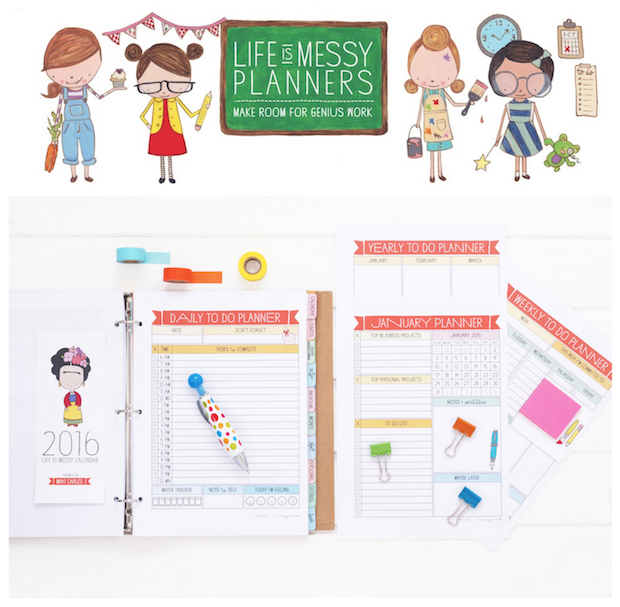 Mayi Carles sells these attractive planners, but she could just as easily give away a digital sample as a lead magnet to whet your appetite for more. A worksheet (or workbook) is similar to a planner, except that it usually helps people to complete a specific exercise or figure something out. A perfect medium for this is an editable workbook that someone can simply download and fill out right on their computer. 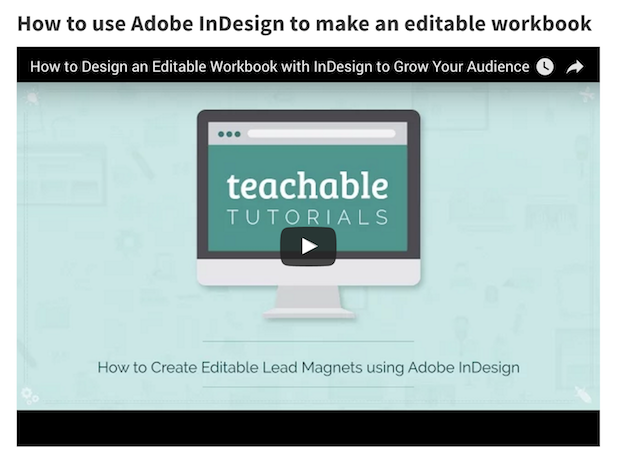 Teachable has a really great, in-depth tutorial on using Adobe InDesign to create a workbook lead magnet. A printable is especially great if you are in a creative industry and your users want something attractive that they can print out. 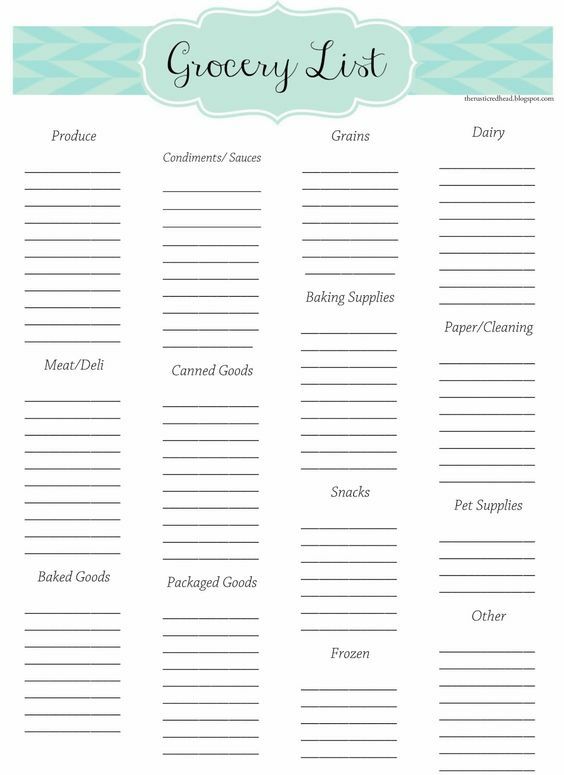 Or, perhaps your user needs to print something out so that it is handy when they need it, such as a shopping list or a grocery list, like this one from Rustic Redhead. Does your user need inspiration? People search the internet for inspiration all the time, so why not give it to them as a neatly packaged lead magnet! 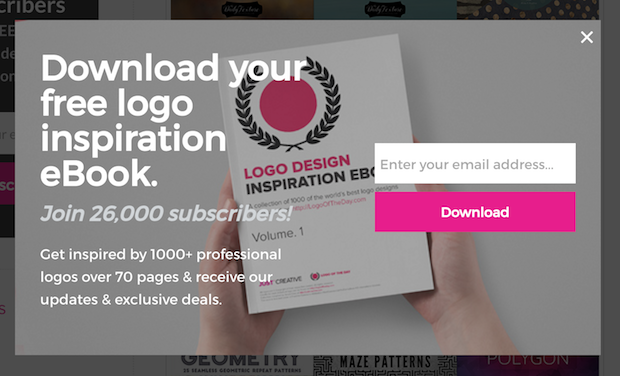 This Logo Design Inspiration eBook, for example, is perfect for a designer seeking inspiration for their next logo. While inspiration files generally offer visual inspiration, prompts help to inspire by giving you ideas to think about. 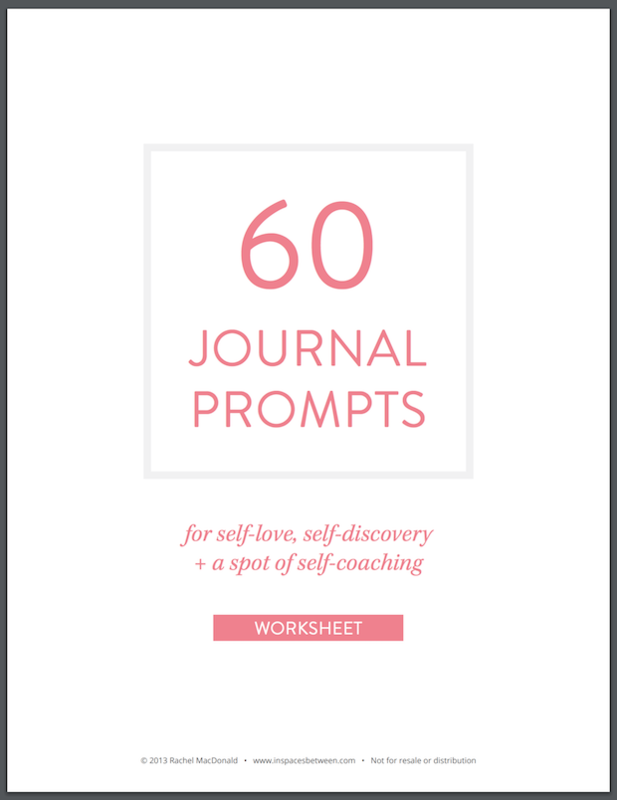 60 Journal Prompts is a self-help lead magnet that helps users with “self-love, self-discovery + a spot of self-coaching”. If your users need to deal with numbers, why not create a calculator and gate it as a lead magnet. VWO has some great calculators on their site that could be packaged as lead magnets too. 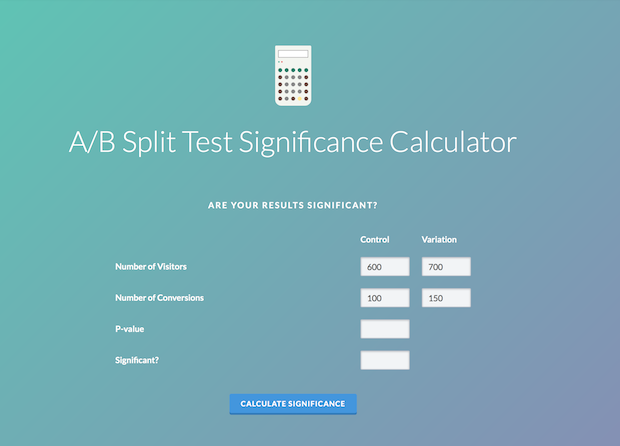 For example, this A/B Split Test Significance Calculator comes in handy for any marketer looking to see whether they have enough traffic to collect any significant data. People often search for generators that they can use to create something quickly, without having to think. If a generator would be useful for your audience, you should consider gating it. 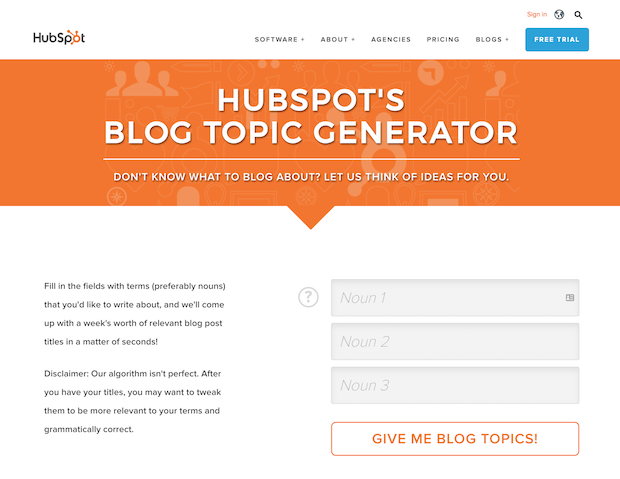 HubSpot has a useful blog topic generator on their site. They aren’t using it as a lead magnet, but they certainly could if they wanted to. Spreadsheets can be used to create all kinds of useful resources. They’re basically a programming tool, right at your fingertips! 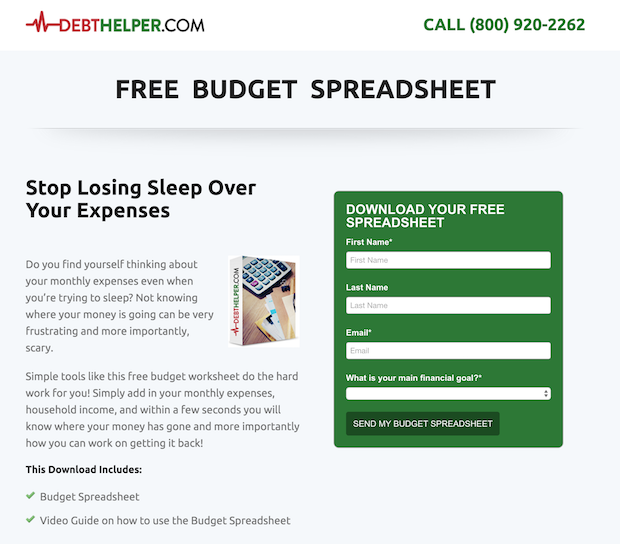 DebtHelper uses a free budget spreadsheet to collect email subscribers. They even include a bonus video guide on how to use the spreadsheet. There are tons of recipes freely available on the internet, so you might not think of this as a good lead magnet idea. However, you’d be surprised at how many people will opt in for your curated recipes. 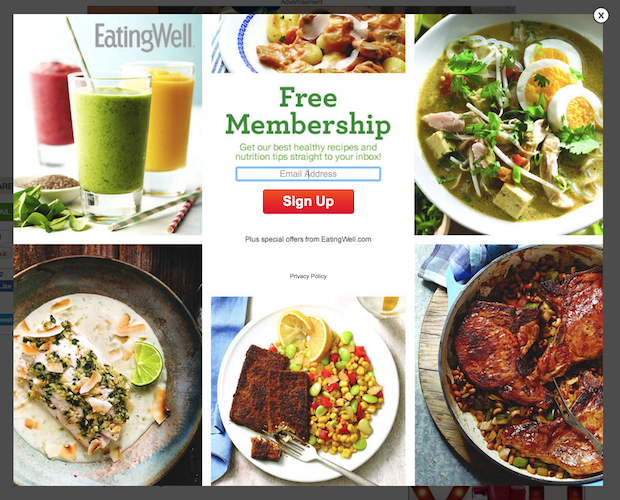 EatingWell knows this, and that’s why they use an exit-intent popup to offer their best healthy recipes and nutrition tips, delivered straight to your inbox. Educational lead magnets teach users about a specific topic that is highly relevant to your offerings. These lead magnets help users to understand why they need your product or service, so they’ll be primed to buy. The best part about educational lead magnets is that they position you as the authority in your industry. People will remember where they first learned something, so educating them is a really great way to build brand awareness and credibility. Gated content is simply a blog post, or part of a blog post, that is hidden behind an email optin form. 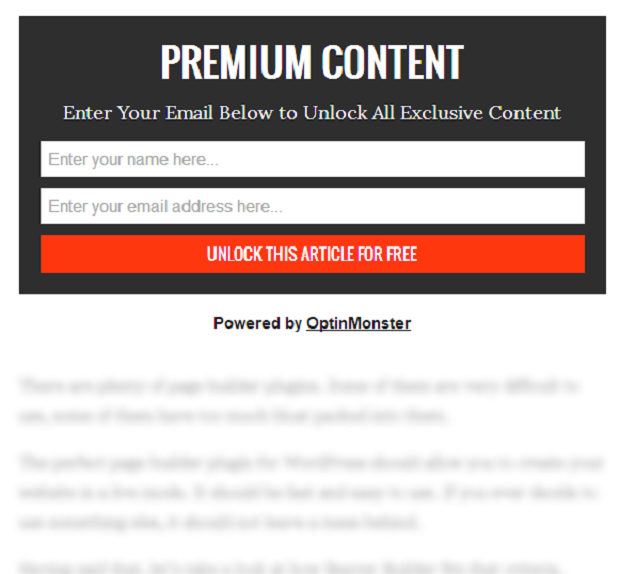 This is one of the easiest lead magnets to create because it uses your existing content! One thing you can do is to gate the second half of a long blog post. You can do this quite easily with OptinMonster by using one of our inline optin form templates + our Content Lock feature. A tutorial is any piece of content that teaches how to do one specific thing. It could be a video, or simply a PDF download with a numbered list of steps. David Siteman Garland’s 7 Proven Steps to Creating, Promoting & Profiting from Online Courses seems to be working really well for him– he’s been using it for quite some time now, although it was probably very quick to create. Quick tip: whether your tutorial takes the form of a video, a PDF download, or a piece of content on your site, use a list-style headline (“X Steps to XYZ”). People like to know exactly how many steps your tutorial is going to take, so this headline style helps it to convert much better. I don’t generally recommend using eBooks as a lead magnet. eBooks don’t convert as well as checklists or cheatsheets, since they tend to be lengthy and difficult to consume. However, sometimes an eBook can work. For it to work, what you need is a really strong benefit. Why should someone take the time to read your eBook? 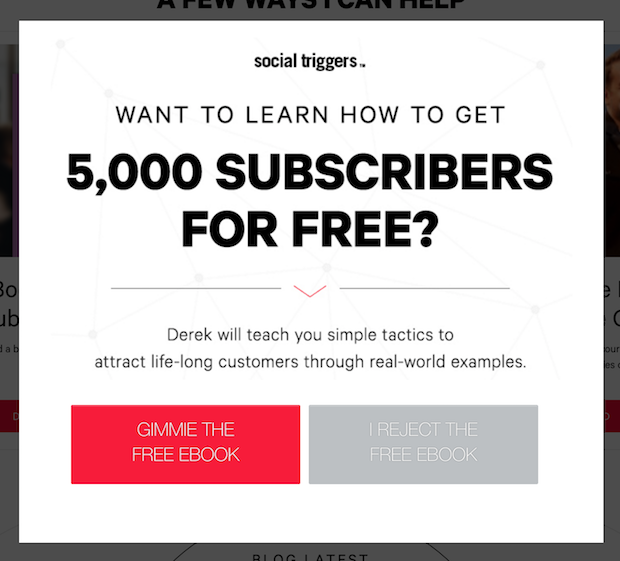 Derek Halpern’s eBook Get 5,000 Subscribers features a benefit that is irresistible to his target market. Still, if someone can achieve the same result from a simple checklist, then by all means give them a checklist instead. It’s really not worth spending weeks to write an entire eBook when you can get better conversions from a PDF that took you 20 minutes to put together. A guide is similar to an eBook in that it is a lengthier lead magnet to create. However, guides can work really well when you use them as the nurturing part of your sales funnel to educate prospects on why they should buy from you. 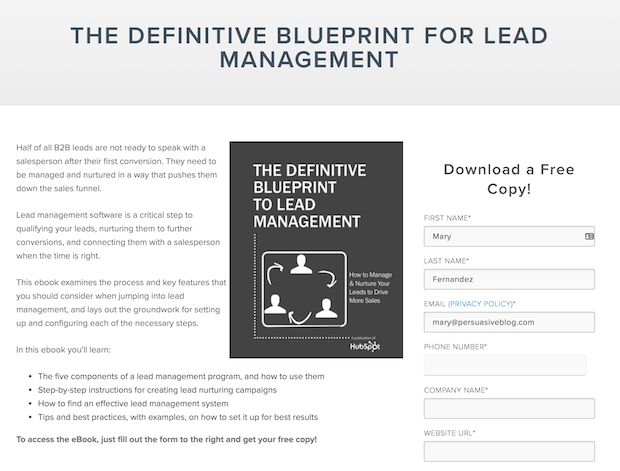 Here’s an example of a guide from HubSpot: The Definitive Blueprint for Lead Management. This works because it educates their users on why they need a lead management product like HubSpot. That being said, I’d encourage you to create some un-gated guides on your site. At OptinMonster, we like to call these “mega guides”. We’ve used mega guides on OptinMonster and our other web properties with great success because they generate a ton of organic search traffic. Check out our Definitive Guide to Email Marketing as an example– it is freely available with no email optin required. Reports are particularly good lead magnets for B2B businesses, but they can also work in any industry that relies on data, statistics or research. You can either do the research and collect the data yourself, or you can pull together data from various sources into one, comprehensive report. 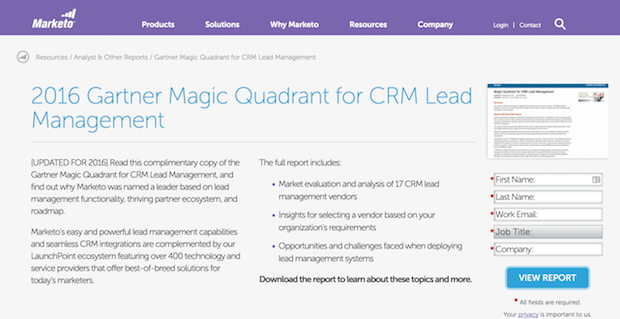 2016 Gartner Magic Quadrant for CRM Lead Management– the great thing about this report is that it has been “updated for 2016”, so at the time of this writing, it is fresh and new. The YouTube Traffic Report– this report pulls together the statistics on YouTube traffic, so it didn’t require any in-house data collection to create. Infographics are usually the type of content you’d think to use for driving traffic to your site, since they do so well on social media. However, they also work very well as educational lead magnets. Think about it: many people need to visualize a concept before they can fully understand it. So instead of giving users a bunch of boring text to sift through, why not illustrate your point with an infographic? This extra level of detail will make your lead magnet stand out so much more. 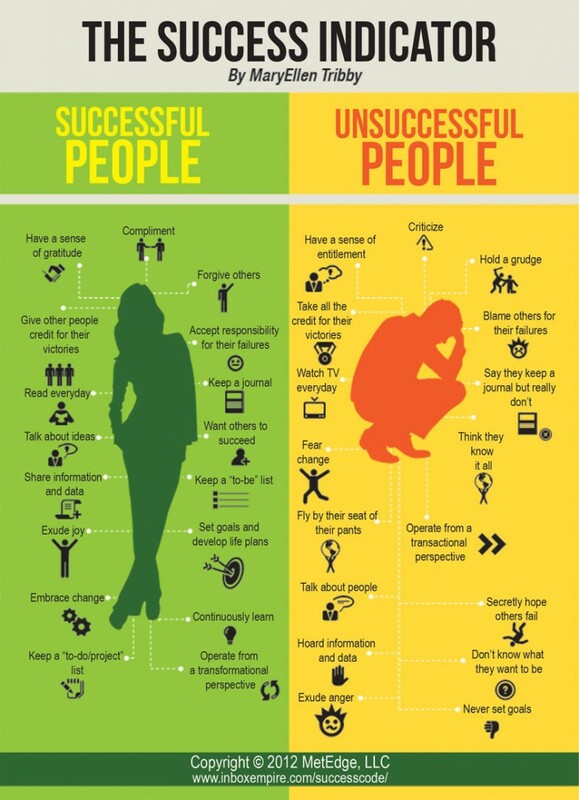 Here’s an example of an infographic that explains the habits of successful people vs. unsuccessful people. Don’t you think this infographic makes the concept that much more memorable and easy to digest than a plain text PDF would? If you want to take your lead magnet one step further than an infographic, create a video! Videos not only include a visual component, but they have an audio component as well. Plus, you can put real people in front of the camera (or come on camera yourself) to really boost your brand. But the best part is, videos have a higher perceived value, making them that much more irresistible. 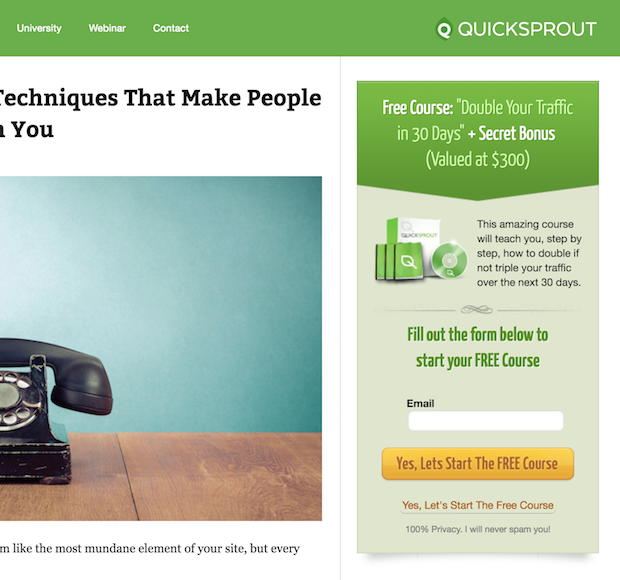 QuickSprout has a video course on how to Double Your Traffic in 30 Days. In their sidebar optin form, they’ve included a DVD mockup to drive home the high value of their lead magnet. Depending on your target audience, a downloadable audio might make the perfect lead magnet. For example, if your ideal customer rarely has time for reading or watching videos, they might prefer to have something to listen to in the car on their commute to and from work. Remember: you can always repurpose a video by simply stripping out the audio and turning it into a lead magnet! Here’s an example from Marie Forleo: a motivational, free audio training to learn “how to get anything you want”. 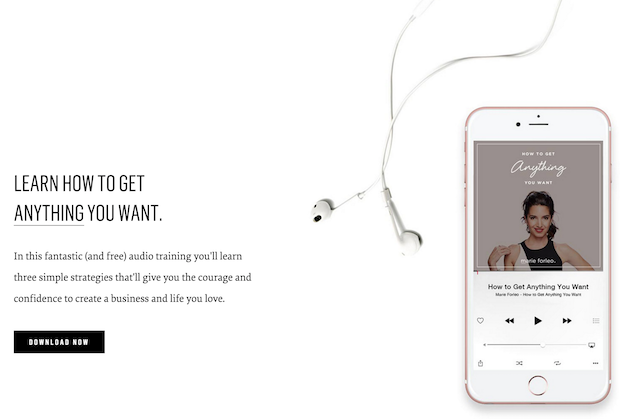 I especially love the use of the rose gold iPhone mockup with earbuds, which perfectly depicts the way one of Marie’s users would listen to her audio (e.g. they may download it to their phone and take it with them to the gym). Like video and audio lead magnets, webinars also have high perceived value. In fact, they are even more irresistible because they have another component: urgency. Since live webinars only occur at specific times, and may have only a limited run, they play on the “fear of missing out”. Heck, webinars work so well for lead generation that Neil Patel turned his entire homepage into a webinar registration page! If you use WordPress and are looking for an LMS plugin for WordPress to easily launch a webinar or online course, check out our top picks! Similar to a webinar, you can offer free tickets to a live event in exchange for an email address. The best way to do this is by using social media ads to push targeted traffic to your optin form. Your target audience, of course, would be people with interests related to your offer, and who are living in the vicinity of your in-person event. I highly recommend using Facebook ads for this, because Facebook has the most powerful targeting features out of any other social media advertising channel. Just make sure that you follow these 7 steps to optimize your Facebook ads for conversions. Email courses are fairly easy to put together because they don’t require you to create anything fancy or downloadable: it’s essentially just a simple email autoresponder series that teaches users how to accomplish something specific. The best part about email courses is that they can be used to turn prospects into customers. 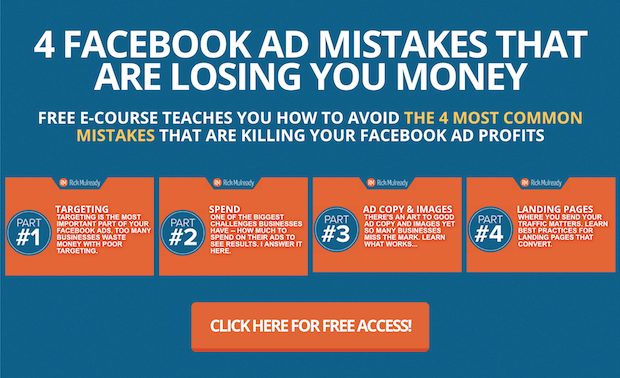 Rick Mulready uses his email course called 4 Facebook Ad Mistakes That Are Losing You Money to convert leads into customers for his FB Ads for Newbies course. If you have a bunch of physical books you’ve written just lying around, consider giving them away as a lead magnet. All you have to do is collect a small fee to cover your shipping costs. You know why this offer works so well? Well, physical books generally have higher perceived value than eBooks do. So when you offer a physical book for free, it’s a really irresistible deal. However, because the user has to actually pull out their credit card to pay for the shipping, this lead magnet pre-qualifies the very best leads. In other words, you’ve not only acquired a new lead, you’ve effectively acquired a new customer– and existing customers are so much easier to convert to a higher offer than people who’ve never bought anything from you before. Here’s an example of a free book plus shipping from Russell Brunson. If you don’t want to go the free book route, you could simply pull out one chapter and offer it as a free sample. Just make sure the sample is digital and instantly downloadable, so that your users can get instant gratification from it. If your product takes the form of a video or videos, pull out a sample video or a sample clip and exchange that for an email address. 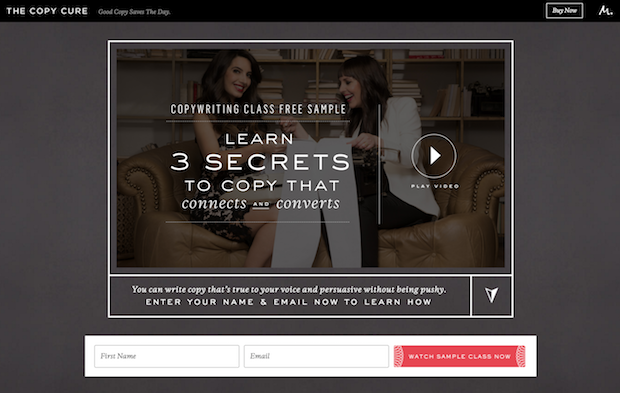 In the case of an information product called The Copy Cure, you can access their Copywriting Class Free Sample by entering your email address. A sample audio clip works well as a lead magnet too (even if your product is actually a video). 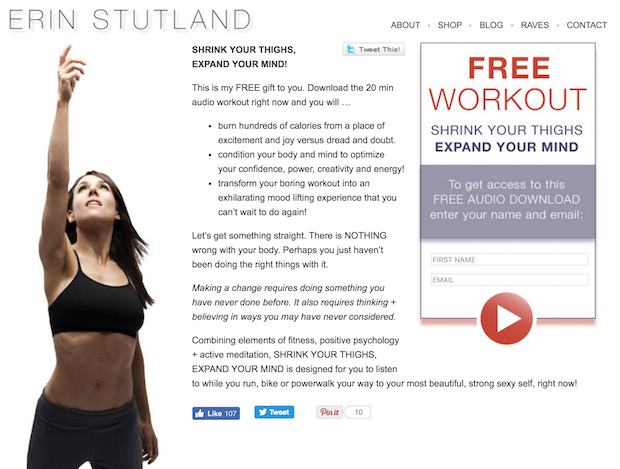 Erin Stutland’s product includes workout videos, and her lead magnet offer is a free audio workout. If you are a coach or you offer a service, you could offer a free coaching session in exchange for an email address. The great thing about coaching sessions is that they get your prospects on the phone with you, and those people are usually expecting to hear your pitch at the end. This can be a really effective way of acquiring high-end clients. Chris Lema charges per minute for his coaching sessions, but he could offer them for free for a limited time if he wanted to push more signups. This is one of those lead magnets that is so underutilized, and yet it is really easy to create. All you have to do is find your most popular blog posts, save a PDF version of the blog post, and then offer it as a content upgrade. 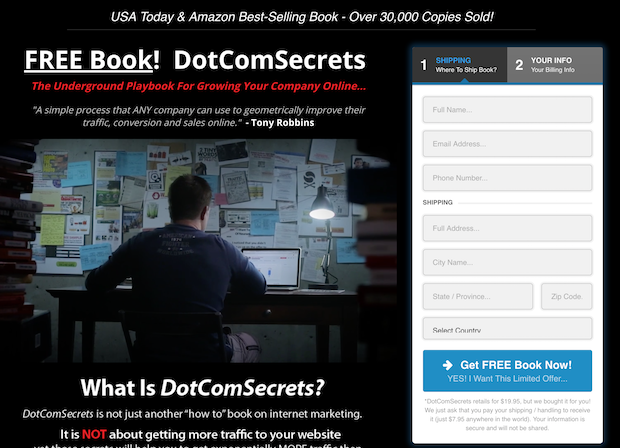 You’d be surprised how many people will opt in to receive the exact same thing they just read in PDF form! The value add here is that they get to own your blog post. 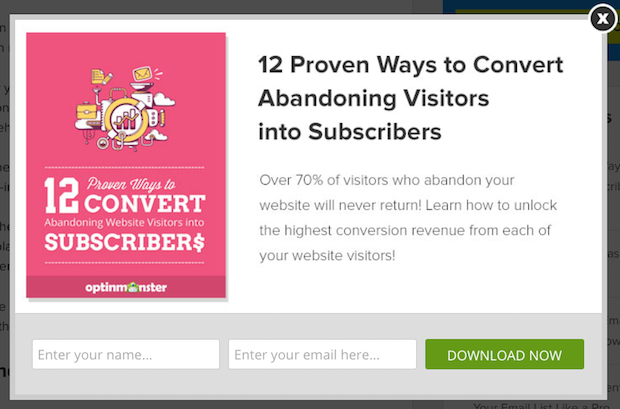 For example, our 12 Proven Ways to Convert Abandoning Visitors into Subscribers download could just as easily have been a blog post that we turned into a lead magnet. While we’re on the subject of repurposing content, why not repurpose a video by offering a transcript? Although many people prefer video for learning, many other people prefer to read. Making sure you have both learners covered is a great way to provide more value with the content you’ve already created. Similarly, you could offer an audio version of a written piece of content. 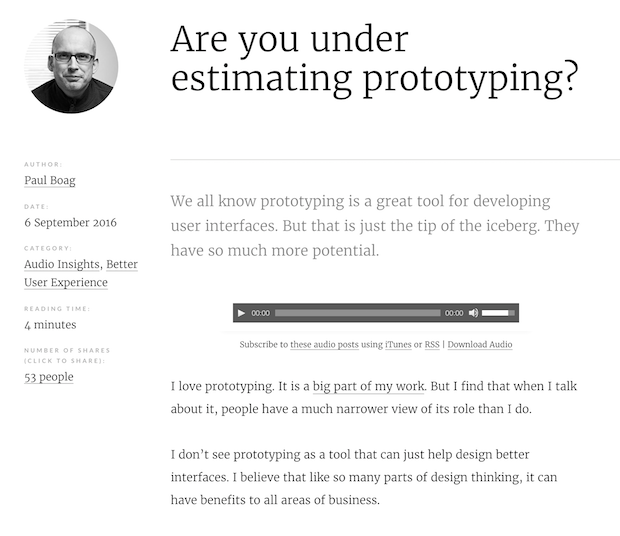 UX designer Paul Boag regularly records an audio version of his blog posts. However, he could just as easily gate the audio version behind an optin form and generate more leads! Do you have a really long, in-depth guide that your users love? Package a summarized version of that into a lead magnet. You can also share what you’re learning from other influencers in your industry by offering your “cliff notes” version of their presentation, or their book. This is another great lead magnet idea for B2B businesses. It’s basically the same thing as a report, except that it focuses on fresh, new industry trends. Just keep in mind that you’ll need to come out with new or updated versions of your state of the industry report on a regular (usually annual) basis. If you’re looking to become a leader in your industry, make some predictions about your industry and publish them as a downloadable lead magnet. People absolutely love to hear predictions about what to expect so they can get a jump on upcoming trends. For example, if you are in the fashion industry, you could come up with a list of fashion predictions for the following year. Or if you are a marketer, you could predict what the state of email marketing will look like next year. Mind maps explain a complex subject in a very digestible way. And because they don’t require too much detail (they’re essentially an outline), these types of lead magnets are really quick to put together. 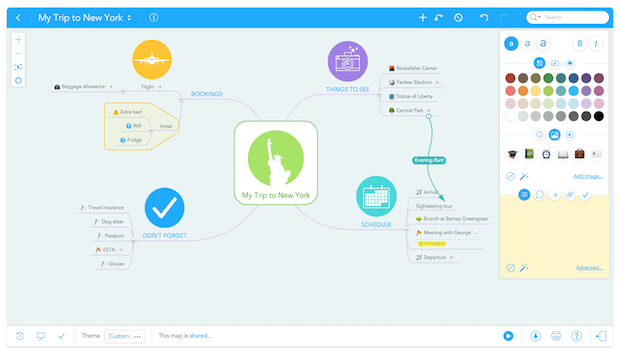 When creating mind maps, I like to use a free tool called MindMeister. Their drag-and-drop builder makes mind maps super easy to create, and they always come out looking clean and professional. 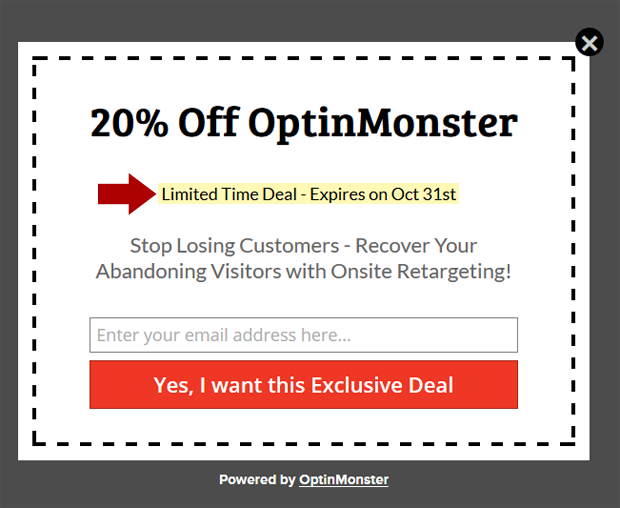 Delivering one of these lead magnets with OptinMonster is simple– all you have to do is paste the mind map URL into your optin form’s success theme. Are you presenting any live webinars? You can repurpose those webinars by saving the recording and using that as a lead magnet. Kissmetrics offers an entire library of recorded webinars that you can choose from in exchange for your email address. Have an eBook that your audience loves? Repurpose it by recording an audio book and gating it behind an email optin form. Remember what we said earlier about eBooks not being the greatest lead magnets because they are so long to digest? And remember how we also said that un-gated mega guides are powerful assets that you can create to drive traffic to your site? Well, here’s an idea for you: turn your eBook into a traffic generating mega guide by transferring it to one, big long page on your site. Then, generate leads by adding a call to action to download your audio book version. Win and win! 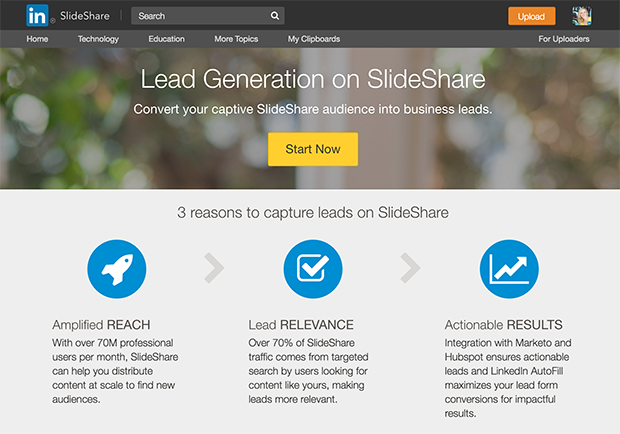 Did you know that you can actually turn one of your SlideShare presentations into a lead magnet? SlideShare has a built-in lead generation tool that allows you to convert your SlideShare audience into email subscribers. All you have to do is follow our step-by-step tutorial here (see #7). If you’ve ever written a roundup blog post, you’ll know that these are very popular and very easy to put together. Plus, you can create a lead magnet from it. A roundup post is essentially a list of tips or techniques from other experts in your industry. To write one, you simply need to interview people and pull all of the quotes together into one big post. For example, I wrote a popular roundup post where I asked 13 seasoned entrepreneurs to give their best beginner advice. Now, I actually could have interviewed a lot more than 13 people. It’s a lot easier than you may think to get influencers to respond to a request like this because you are offering them exposure, which is what they want! So what I could have done is interviewed even more experts, and then offered the complete roundup as a free download. Or, I could have simply summarized all of the expert responses into actionable takeaways, and packaged that as a lead magnet. Either way, it would make for a great content upgrade to an already high-performing post. Sometimes your email newsletter itself is so irresistible that it it’s the lead magnet in and of itself. A great example is a business called The Hustle. The Hustle sends you a funny, entertaining email each morning with all the top tech and business news for the day. The best part about this lead magnet is that the subscriber is already expecting the emails. So although I don’t know how low their unsubscribe rates are, I would assume that The Hustle is doing pretty well in that department. Do you have lots of different educational lead magnets? Give your users the option to access them all at once by putting them together into a “vault”, or a virtual library on your site. All you need is one big page on your site with the links to download each of your lead magnets, and put that page behind an optin form. It’s a simple way to give more value to your users with the lead magnets that you’ve already created. Some lead magnets don’t need to be particularly useful or educational– they can simply entertain. A quiz is quite possibly the most entertaining lead magnet on this list, and that’s why it converts so well! A quiz has the user answer a series of questions, and then spits out a result. But in order to get the result, you’ll have to enter your email address. 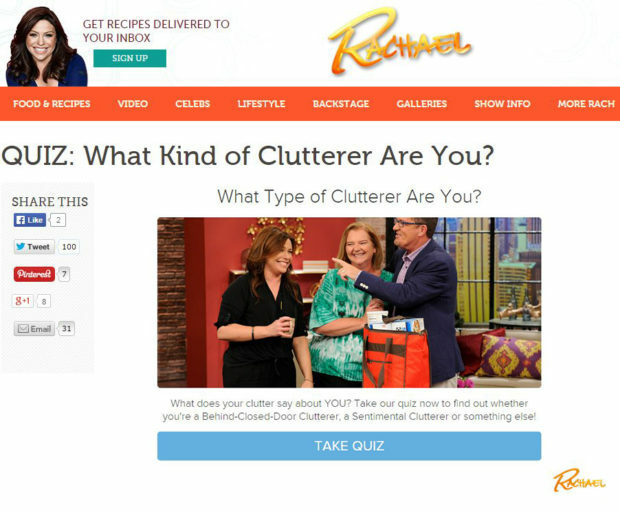 Rachel Ray had a quiz on what type of clutterer you are. 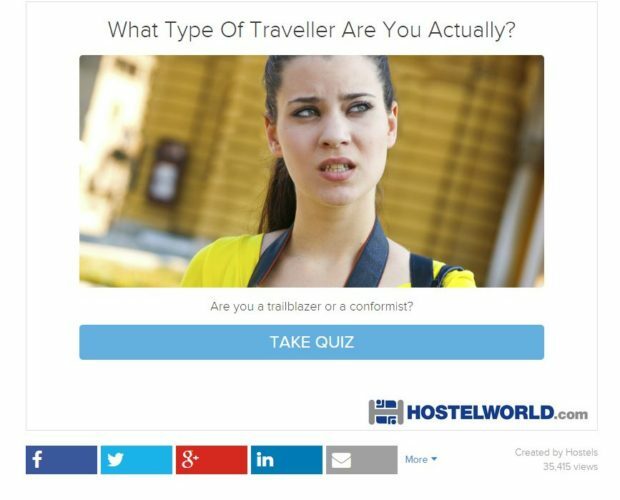 Hostel Bookers created a quiz about what type of traveller you are. Forbes had a quiz that helped prospective college students find the perfect college for them. To create a quiz like this, you can use a tool like Qzzr. Qzzr also allows you to drive social traffic to your quiz and generate leads with it. A survey is mainly for your benefit/market research. However, even a survey can be used as a lead magnet with a compelling call to action. For example, you could ask users who’ve been browsing around your site for a while to give you feedback on their experience, and help you improve your website. You’d be surprised how many people actually enjoy taking the time to give you their feedback! Just make sure that you use a tool like OptinMonster to present the survey only to users who have visited at least 4 pages on your site. It would be weird (and annoying) to ask a brand new visitor to rate their “experience” on the first page view. One of the most effective lead magnets is the giveaway. Who doesn’t love the opportunity to win free stuff? A manifesto is a simple declaration of your values. It makes a great lead magnet because your ideal audience will naturally be drawn to it. 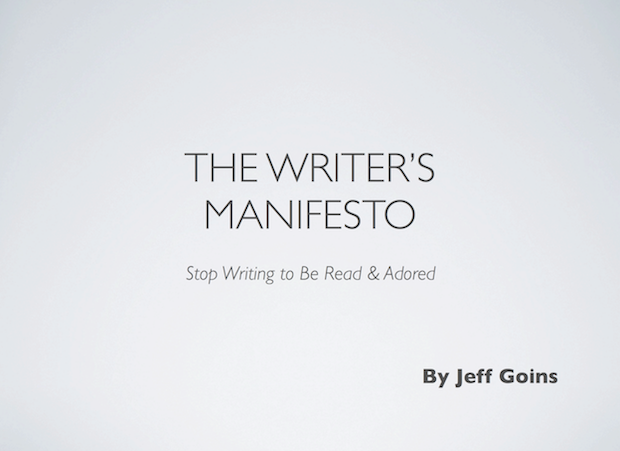 Jeff Goins wrote The Writer’s Manifesto: Stop Writing to Be Read & Adored, which really resonated with his audience and turned out to be a very effective lead magnet. Ever thought to use a comic strip as a lead magnet? …And when something is that popular, it is easy to see how people would sign up to get more. People love quotes from influential people, or quotes that inspire. 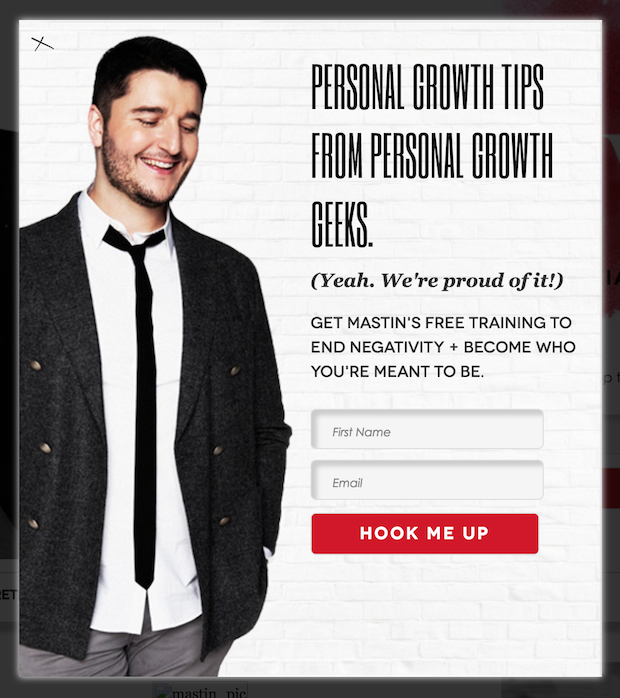 In fact, Mastin Kipp created an entire business around delivering daily inspirational quotes via his “daily love” email newsletter. His business has evolved a lot since then, but he still offers daily inspiration/tips as his lead magnet. Are you an artist, designer or a photographer? 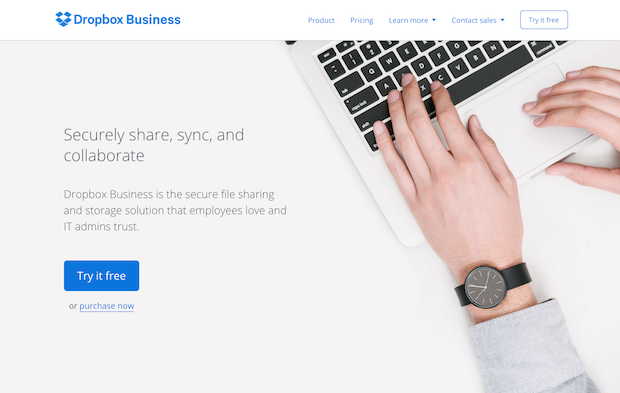 If you are in a visual/creative field of business, you might want to consider giving away some of your work in the form of a desktop wallpaper download. The best thing about desktop wallpaper is that it serves as a constant reminder of your brand. This can be a great way to make sure a lead thinks of you when they are thinking about who to hire for their next photoshoot or design project. A free mobile app or game offers the perfect excuse to ask for an email address. Simply ask users to create an account with you in order to use your app. Then, you can send them emails to help increase their engagement, and encourage them to buy your premium product. Businesses like to create communities in order to have a dialog between their brand and their prospects. Communities are also a place where users can interact with each other, and that’s a really valuable thing that many people are willing to pay good money for (let alone give their email address for). 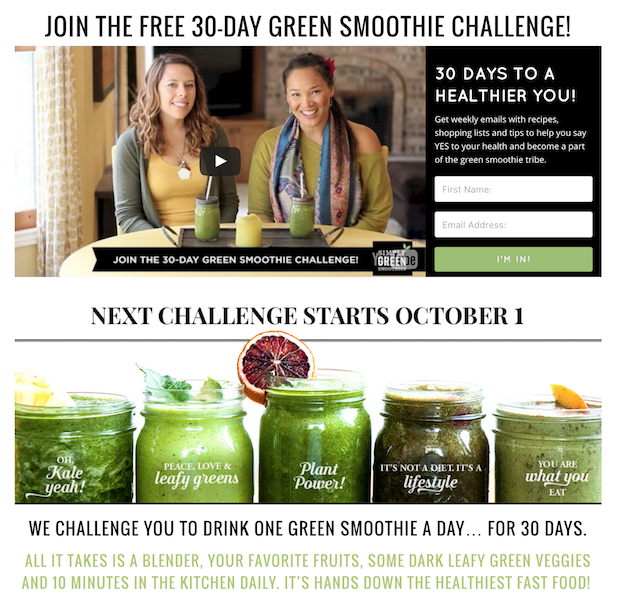 One of my absolute favorite lead magnet examples is this 30-Day Green Smoothie Challenge from Simple Green Smoothies. Anyone who takes them up on this offer is going to be a highly qualified lead. They are basically raising their hands and saying, “I want green smoothies!”. Challenges with a start and an end date have urgency. This makes the offer that much more compelling. Challenges build brand awareness by fostering a sense of community– everyone is doing the challenge together, at the same time. Challenges make it much easier to elicit desired behavior through peer pressure. Most people wouldn’t have the discipline to drink one green smoothie a day for 30 days, but they are much more likely to jump on the bandwagon when challenged to do so. Thinking about creating your own membership site? You might want to consider offering free registration. 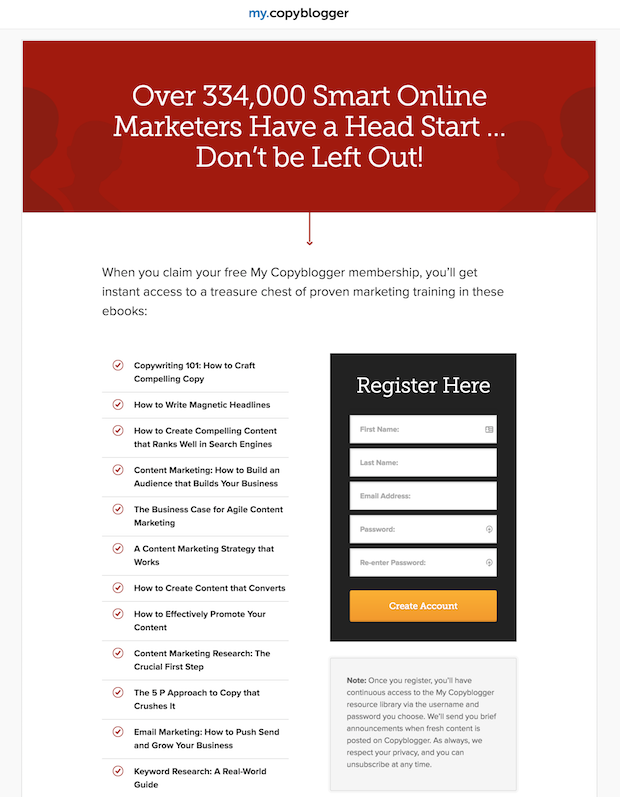 My Copyblogger Membership is a great example of using a membership site as a lead magnet. I especially love their use of social proof and fear of missing out. This community contains “over 334,000 smart online marketers”, and all those people “have a head start” on you. Better sign up now so you don’t get left behind! If you’re a WordPress user interested in setting up your own membership site, plugins can make it super easy. Check out our top picks for WordPress membership site plugins! I’ve personally used Facebook groups as lead magnets with great success. It just goes to show that people really do value communities. For example, I used to offer a private Facebook group + a free fitness challenge for pregnant women who wanted to stay healthy and fit throughout their pregnancy. I tested a few different offers instead, such as a checklist of exercises that every pregnant woman should avoid. However, the Facebook group/challenge offer out-performed the other lead magnets, resulting in 43 cent leads on average! Depending on your target market and where they hang out online, a Facebook group may not be a feasible option. However, you could offer a Slack group instead. If you’ve never heard of it before, Slack is an app that allows you to send instant messages to groups of people. This can be a really fun–and powerful–way to build a community around your brand. 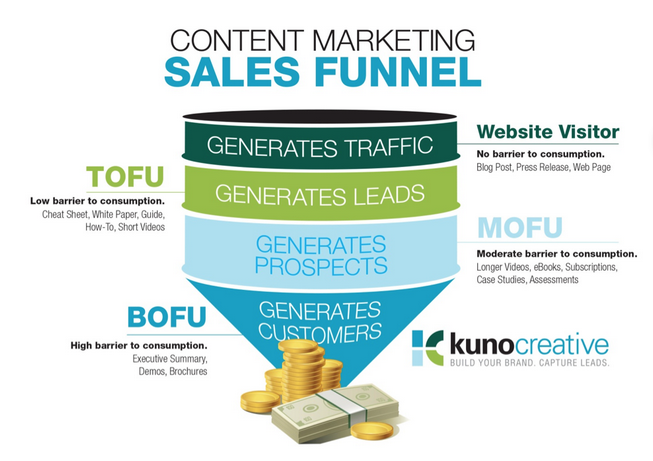 Ordinarily when you think of lead magnets, the bottom of your sales funnel isn’t the first thing that comes to mind. Usually, the goal of a lead magnet is to move top of funnel prospects into the middle of your funnel, or the evaluation phase. However, not all customer journeys are that linear. Sometimes a prospect hasn’t given you their email address yet, but they are already thinking about buying your product. Maybe they were referred to you by someone, or they’ve read reviews about you on another site. You need to be prepared for these hot prospects by building lead magnets at the bottom of your funnel. If you’ve ever shopped around for an app or a software tool, you’ve probably seen a ton of these lead magnets without even realizing it. Most software companies will have a large call to action to sign up for a free trial or demo right on their homepage. Why? Because that’s how they get your email address. But you don’t have to be a software company to benefit from a free trial lead magnet. SnackNation offers a free sample box of their product. They just ask for your work email address (no credit card required). Now that’s a pretty irresistible offer! A coupon works really well at the bottom of your funnel because most people who make online purchases like to shop around for deals. Your brand should be there to give those people what they are looking for (in exchange for their email address, of course). Prospects at the bottom of the funnel love to read case studies. This type of lead magnet could give them that one last push they need to buy your product. 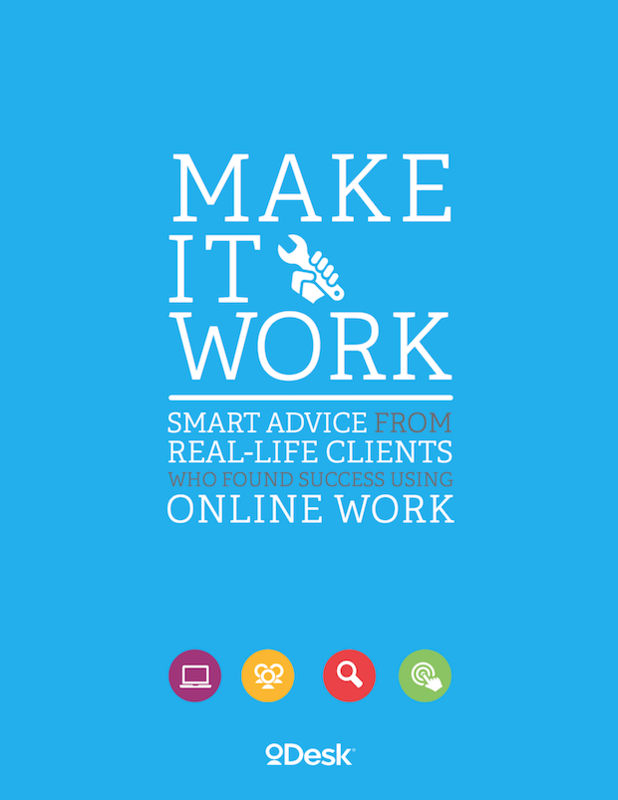 Back when Upwork was still oDesk, they had a lead magnet called Make It Work: Smart Advice From Real-Life Clients Who Found Success Using Online Work. This is simply a compilation of case studies from people who used their service, packaged in PDF format. Do you have an upcoming product launch? 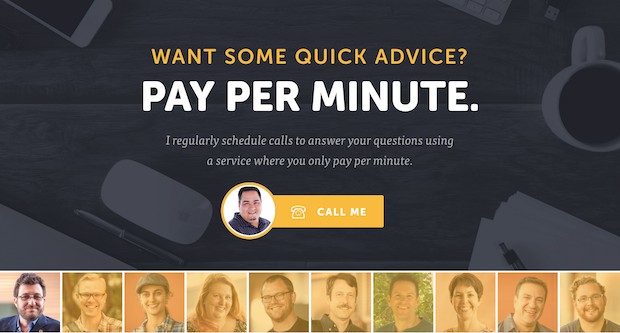 You can use a waitlist to collect the emails of prospects at the bottom of your funnel. For example, an online course called “B-School” is only available once per year. If you are looking to buy it right now, well, you can’t! 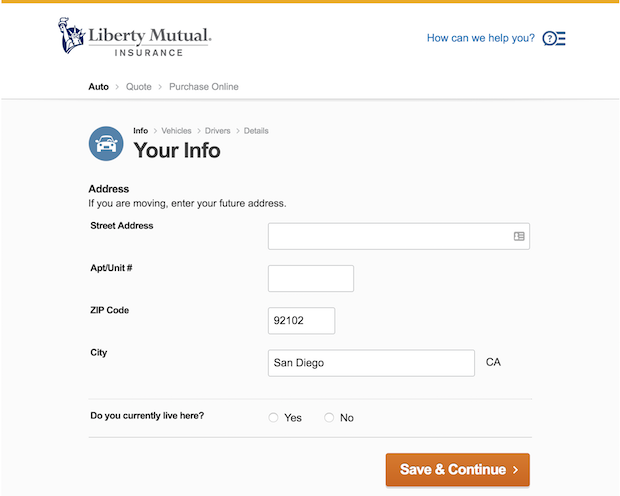 Instead of a “buy” button on the product page, what you’ll find is a “tell me more” button next to an email optin form. This way, they can collect email addresses of bottom of funnel prospects all throughout the year, and build up anticipation for the program. To sweeten the deal of getting on your waitlist, you might want to offer an early bird discount. This is a great way to reward your most enthusiastic prospects at the bottom of your funnel. Free shipping is one of those things that everyone wants when it comes to shopping online. 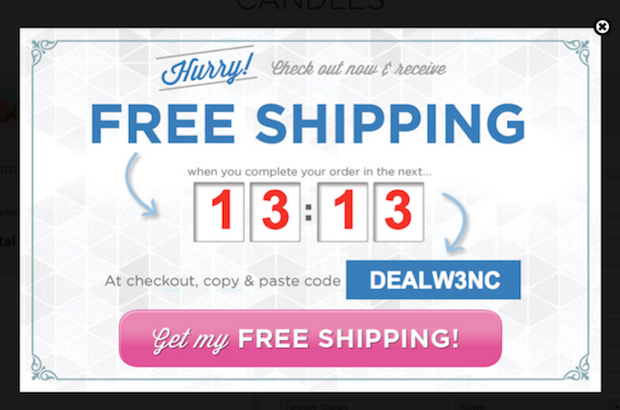 So if someone is really close to making a purchase, free shipping just might be the offer that seals the deal. Many lawyers offer free consultations as lead magnets. This could be a great bottom of funnel offer for you as well if you offer a service. The best thing about a free consult is that it gives you a very natural excuse to ask for the email address, and even a phone number and other relevant information. If you need to close someone over the phone, this is a natural opportunity to do that. 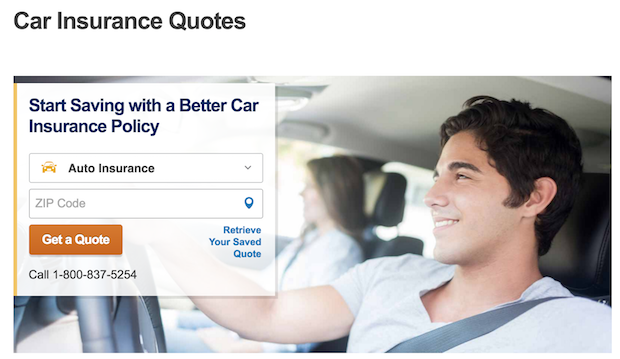 First, you’ll be asked to enter your zip code and click on the “Get a Quote” button. Then, you’ll be directed to another page where you’ll be asked to enter the rest of your information. With most lead magnets, you would never be able to ask for this much information up front. However, because a free quote is at the bottom of your funnel, these prospects are more willing to give out their detailed information. 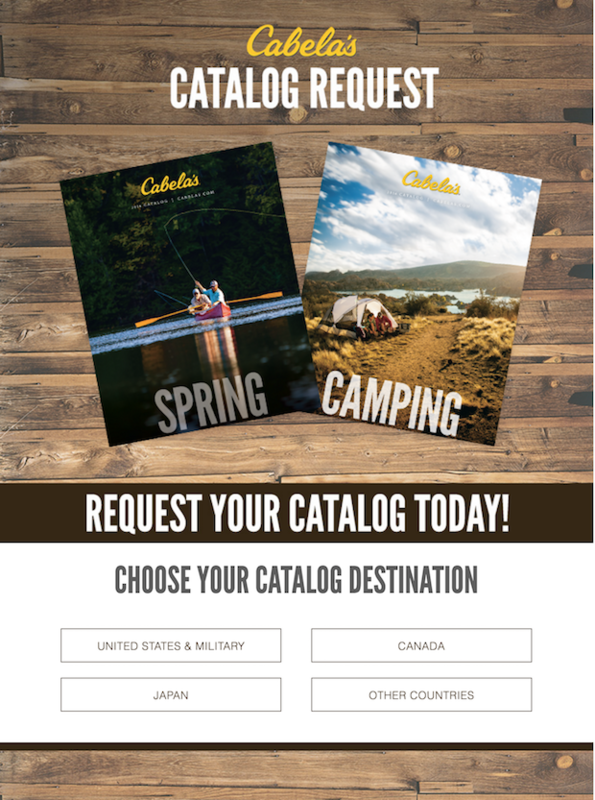 Finally, if you have a product catalog, don’t forget to offer it as a lead magnet at the bottom of your funnel! Just remember to ask for their email address on the order form. That’s it. Now it’s your turn. Go ahead and pick one of these high-converting lead magnet ideas, and then tweak it to create your own. We’d love to see what you come up with, so please share your lead magnet creations in the comments below. Once you have created your lead magnet, you’ll need an easy way to deliver your lead magnet with a high-converting optin form. That’s where OptinMonster can help. 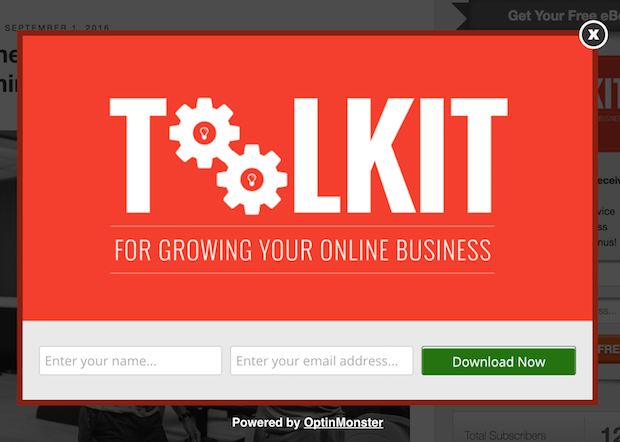 Get started with OptinMonster today to convert more website visitors into subscribers! Mary Fernandez is a professional blogger. When she’s not at her desk, you can usually find Mary exploring sunny San Diego, CA with her laptop, husband, and three kids in tow. Woah, Mary…Thanks for all the examples. The points are very easy to go through with them. You’ve covered almost every single kind of lead magnet that exists. Thanks for the post, Mary. Comprehensive list. Very valuable 🙂 All of a sudden, I’ve tons of ideas for creating lead magnets. Thanks to you! WOW! That’s a really cool list! 🙂 — Thanks for putting this together. OMG! What a great list! Helped me with a mental block that I’ve been having for months! I am so glad to hear that J!! Wow! This is so very thorough and clear. I feel like a lead magnet pro now that I’ve read this. Great work!! Thanks for the wonderful tips. Which of these do you think fits for a digital marketing plan for primary and secondary schools. You’re very welcome, Adetunji! Any of these ideas could work, but the obvious choice would be one of the educational lead magnets. Good luck! I am so glad to have a chance to read your wonderful article. I am looking forward to read more of your works and posts.Thanks for sharing such a nice article. i love your writing. your idea is mind blowing that’s why i would like to appreciate your work. So glad you liked it, Lissy. 🙂 You might also enjoy this post on how page-level targeting can help you generate more leads. I love this list. It is exactly what I was looking for. One question. I work for a real estate office and really like the thought of community lead magnets, but the link to see examples is not working. Can you point me to some of those examples for inspiration? Happy you found it useful, Brandon. 🙂 Next, check out our guide to Twitter for lead generation. Fantastic article. 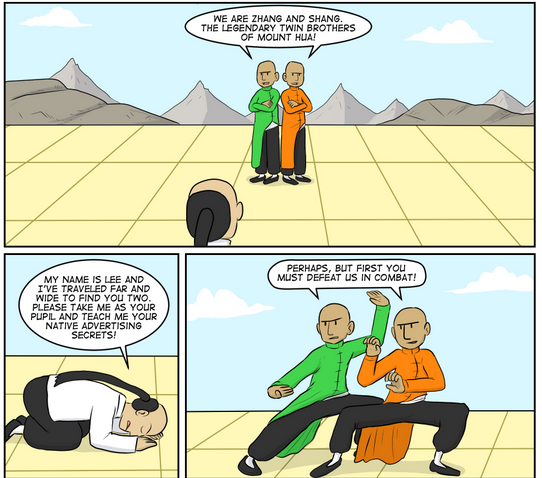 No stone left unturned! I have linked to it in an article on website launch strategies. Lead magnets in various forms are important audience building methods in any campaign. Thank you, Geoff! Glad you enjoyed our guide. When I research a topic, especially in our field; I usually open 10 tabs and move to the second tab in a second. It is easily understandable even from the first sentence that the content is just created to have more content and to drive traffic – not to give a value. This blog post thought me a lot, I feel like I almost read a book or get a precious course. Thanks so much for the effort. I took notes and I’ll happily use in my business. I came to this article with no idea of what I could have for a lead magnet and will leave it trying to decide which one to use. Love the idea’s and picture examples that bring them to life. Thanks so much for the in-depth wonderful article you turned out here!